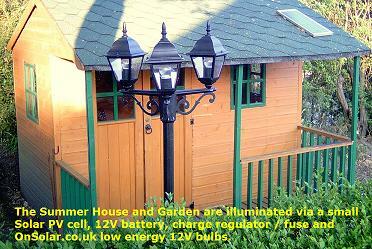 Our 12 volt DC garden lighting system began over 2 years ago with the idea of having low voltage lighting in our small garden “pavilion” – simply powered by an ordinary 12 volt car battery that could be periodically charged from the mains. I began with a low voltage kitchen light fitting from B&Q, which used 4 x 12 volt halogen MR16 down-lighters and a mains transformer in the base. I disconnected and removed the transformer allowing the unit to be wired directly to the battery. This gave a fantastic light, but due to the fact that they were halogen lamps, drew a lot of current and quickly flattened the battery. 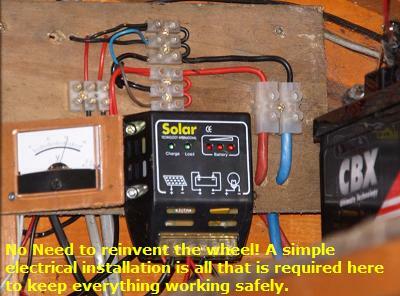 I than had the idea of fitting a small solar panel on the roof of the building that would keep the battery trickle charged, and at the same time to replace the halogen lamps with LED alternatives that only draw 1 watt of power each. 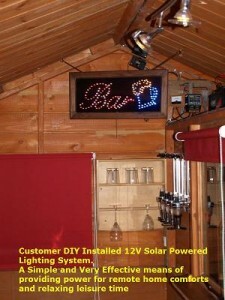 A 20 watt panel, and the lamps, were supplied from Maplin, who included a charge controller with the panel that ensures that the battery is not overcharged on very bright days. I also wired into the set-up a 12 volt voltmeter that gives a quick indication of the battery condition. To ensure that the lamps receive a stable 12 volt supply, I purchased a voltage regulator with a built in fuse. LED lamps benefit from a regulated supply that allows them to be operated at peak efficiency and maximizes their operating lifespan. A fully charged car battery can supply fluctuating voltages from 11 to 14 volts, and the regulator evens out these peaks and troughs in the supply. More information on battery storage, and made-to-order regulators (about £5.00 each) can be had from Renewable Energy UK’s web site at reuk.co.uk. This set up worked so well that I decided to incorporate a radio / CD player, for music in the garden during the evenings. Even a fairly basic car CD player these days will allow you to have Radio / CD / MP3 options and a quick trip to the local ALDI store provided an excellent player that also included an SD card slot, and AUX plug for plugging in an external MP3 player or other music source, as well as the built in MP3 enabled CD player. I hard-wired this unit into the building and added two standard car loudspeakers that I cased in small wooden cabinets. The unit was powered via the fused voltage regulator, and now provides excellent sound over quite a large area of the garden. Even with the lights on and the CD playing, I found that the setup was still capable of operating for several hours every evening, having been trickle charged whenever sunlight fell on the panel, so now I started to get more ambitious. 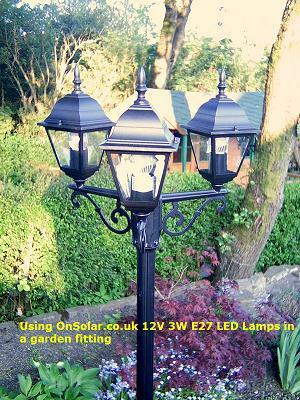 Like most people, we seem to have a large number of small self contained solar lamps marking the edges of paths and other features in our garden, but I now wanted something more substantial to make use of all that free energy. 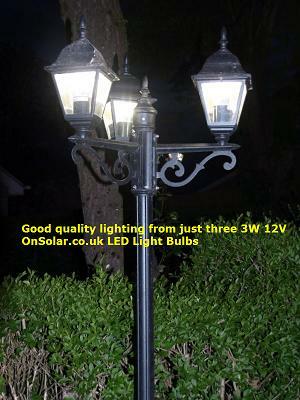 Our local DIY store supplied two 6 foot tall garden lampposts designed to operate on mains voltage, using 3 60watt ES lamps. I installed the posts in the garden, running protected cabling back to the pavilion’s regulated 12 volt DC supply. Then it was time to find suitable LED lamps that would fit the lamp heads. Several internet searches only turned up low voltage CFL tube lamps, but these drew 11 watts of power each, and I really wanted LED lamps, as the internal lighting had been so successful. Then I was lucky enough to stumble on OnSolar’s web pages, offering the ideal solution. Aiming to meet the lighting needs of boat and caravan owners or anyone requiring extremely low power lighting. OnSolar.co.uk has commissioned the manufacture of several styles of 12 volt LED and compact fluorescent bulbs with standard ES Edison Screw and Bayonet B22 fitting. We opted for 3W 12v LED bulbs in an E27 base fitting. These give a mid / warm white light, and only draw 3 watts of power each, and all in a very attractive “Golf Ball” sized unit. I ordered 6 of these 12v E27 units via their OnSolar eBay store, and at 7.00am the following day the postman was knocking at my door with the delivery – full marks to Ken and everyone at OnSolar, and the Post Office, for a fabulous service. That night was time for the big switch on. I have wired the lamp-posts to operate via a time switch in the pavilion. This is a former mains powered unit, converted to operate on 12 volts by REUK, and I set it to switch on the exterior lamps at 9.15pm, when it was dark enough to properly evaluate the new lights. Right on time, all 6 lamps lit up, and I was amazed at how bright these bulbs are. They now light up every evening between 9.15 and 11.00pm, and create a wonderful effect amongst the bushes and trees in that part of the garden, while my wife and I enjoy our music (and a glass of wine!) in the pavilion, and all powered free of charge with energy generated from sunlight. Future plans include adding a second battery and upgrading the existing distribution board. Since discovering solar power two years ago with this small setup, we’ve become very enthusiastic about the potential of the technology, so much so that we now have a full solar PV system on the roof of our bungalow, generating energy that reduces our household electricity bills and earns us extra income from power fed into the national grid, but nothing gives us more pleasure than a glass of wine and a little music and lighting in our pavilion on a summer evening, all supplied by our first, DIY, installation. What a super little project! It sounds as though Mr & Mrs Phillips have gotten bitten by the ‘free energy’ bug and we say ‘way to go! 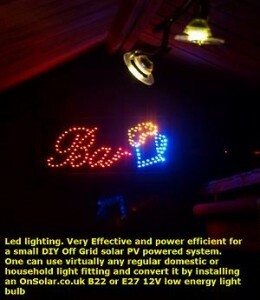 This is truly a great project and just shows what can be done with a little DIY and some ingenuity.